One of the most striking new buildings to be completed in Manhattan this year is hidden from public view. 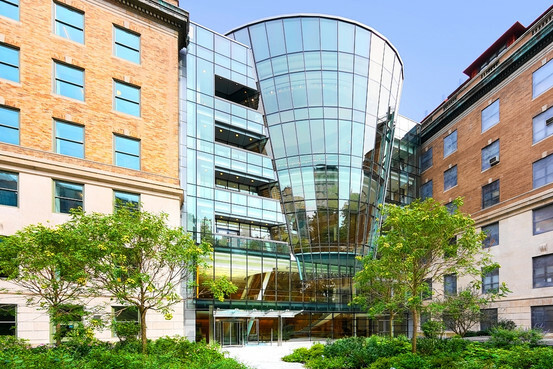 On the gated campus of Rockefeller University between York Avenue and the East River, a renovated research center includes a new building with a curving, five-story glass facade that leans forward like the side of an inverted cone. The new glass building is the centerpiece of the Collaborative Research Center, a $380 million renovation effort that grew out of years of deliberation over how to modernize the historic university's research facilities. A previous administration had advocated a brand-new structure to replace lab space in two adjacent buildings that dated to the first half of the 20th century. Instead, the university in 2006 decided to keep labs in those two buildings but to renovate them and to build a new glass edifice to connect them. The new glass building at Rockefeller University connects two old buildings and has an open staircase. The result: a facility that, like many new offices, creates more common space as well as a more efficient work area. The laboratory floors have no corridors, a design that saves space and, university officials say, allows microbiologists, immunologists, and other researchers to collaborate more easily. The new glass building also connects the two old buildings vertically, with an open staircase running through an atrium that continues the elliptical-cone shape of the outside facade. "This is essentially the only staircase on the campus that encourages anybody to walk up it," says John Tooze, vice president for scientific and facilities operations. Tables, couches and chairs are placed throughout the atrium floors. Viewed from outside, the facade juts out over a three-block-long leafy mall designed 50 years ago by landscape architect Daniel Kiley. The mall is otherwise lined by staid buildings of brick and stone. "We wanted it to distinguish itself from the old buildings," one of the project's architects, Paul Broches of Mitchell Giurgola Architects LLP, says. "It introduces something that's quite contemporary and of the moment." The campus isn't open to the public, but the university sometimes holds concerts and other public events. Cool. I was wondering how this would turn out. They are also suppose to be building a research tower on the campus. Rockefeller's campus also has one of the coolest pedestrian bridges in the city. I don't know why all the attachments are out of order, but what each one is should be self-explanatory. The "Manage Attachments" feature seems to have a mind of its own -- even if attached images are numbered in order they show up in some random order as attachments. There is a way to control that. If, after uploading images, you click the "Insert Inline" option (resulting in the images showing up where you want them amidst you text, rather than in a box with "Attached Thumbnails" at the bottom of the post as seen above) and then "Preview Post" it gives the poster the chance to arrange the images (by cutting & pasting) as best suits the story. It's definitely more time consuming (not terribly so). In a proposal to be formally unveiled Wednesday night, the Upper East Side school will unveil plans to build a two-story research building with a landscaped green roof and a conference center over the highway. 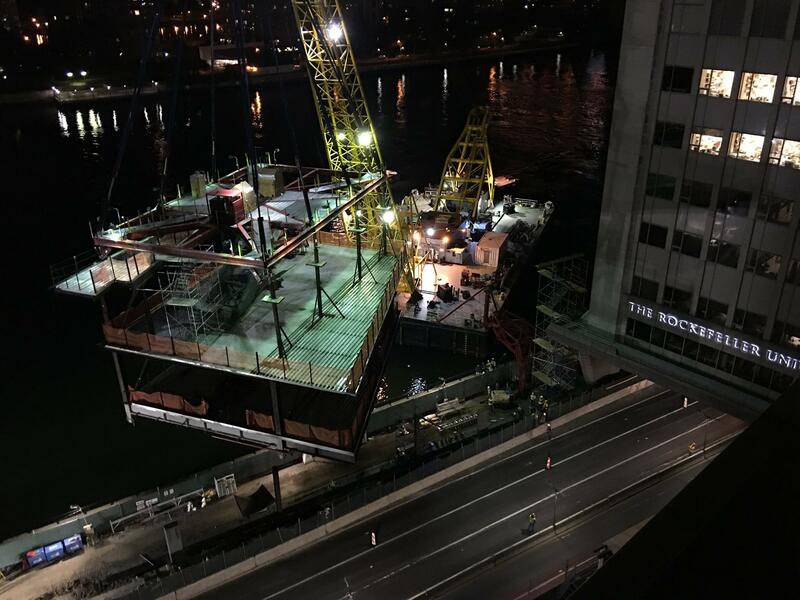 Rockefeller University on the Upper East Side is preparing plans to grow, but with no space left on its campus, the school has come up with a tried and true solution: building new facilities on a deck the school would build over the FDR Highway. The university, which stretches from East 62nd to East 68th streets along York Avenue, will unveil plans Wednesday night to build two small buildings on a platform over the highway along the East River. There will be a two-story research building measuring 160,000 square feet with a landscaped green roof and a conference center. The platform will extend roughly from East 64th Street to East 68th Street. "The new building is critical to maintaining the university's excellent standards for research and teaching, by allowing for the recruitment of new faculty to replace those lost by attrition, and for the renewal of laboratory space that is outdated and poorly suited to modern science," said a spokesman in an email. He stressed that the small buildings would not impede views of or from Manhattan, nor would they expand the university's size "in terms of personnel or activities." This is thanks to an innovative design from local architect Rafael Viñoly, where the two-story building will actually be built into the platform, so that the roof is level with the rest of the campus. This will create a larger quad without taking up space on the expanded campus. Whether the older research buildings will be replaced or redeveloped is still being determined. This is the not the first time the university, established by John D. Rockefeller in 1901 to champion medical research, has expanded over the busy highway below. In 1987, a dormitory building opened atop a platform over the southbound lanes of the FDR between 62nd and 63rd streets. Five years later, a new research building was finished over both lanes of the highway at 64th Street. The new platform will extend from there all the way up to the northern edge of the campus. The university is not the only institution to take advantage of cantilevered real estate: both the United Nations to the south, and Weill Cornell Medical Center directly to the north overhang the highway. On terra firma, the university also has plans to convert a parking lot on the northwest corner of the campus, at East 68th Street and York Avenue, into a new athletic center, which will consolidate facilities from across campus. The project does not yet have a price tag or a firm timeline, though it will need zoning approvals before it can move forward. Wednesday night, the plans will be presented to the local community board's land-use committee, which will eventually vote on the project. The university already owns the air rights over the highway, so once it has the city's blessing, building should not be a problem. Hunter Armstrong, executive director Civitas, an Upper East Side advocacy group focused on open space issues in the neighborhood, said the idea was interesting, but it raised cause for concern over impacts on the adjacent East River Esplanade. “We’re trying to rescue the esplanade, which has long been neglected, so we have to be careful of the impacts of these cantilevers on our park,” Mr. Armstrong said. The Rockefeller spokesman noted that it would be proposing improvements to the esplanade along the length of the campus as public benefit from the expansion, though it would require city support and planning to do so. One dream of Mr. Armstrong’s, that the university would open up its 14-acre campus to the public—a space that will grow larger with the new platform—remains unlikely. “The nature of some of the work we do here, it’s not appropriate to the public coming onto the campus,” the spokesman said. It's becoming quite obvious Manhattan is running out of develop-able land. Institutions will soon need to make that leap into the other boroughs. To who, drivers? Who cares? As for walking on the esplanade along these spaces, maybe they can hide the view of the highway with a vegetative mesh, like what they were planning for the BQE. Cantilevering would reduce the noise created from heavy traffic. Plus it's on the very edge of the island. Win win. ^^ Noise from any traffic, light or heavy, can be mitigated. I walk that esplanade every once in a while. I think they could use this project as the impetus for improvements, that wouldn't be a bad thing. The one issue is that where the HSS/NYH platform abuts the espanade, it seems kind of cramped. With this project, they could integrate some sort of cantilevered platform to make the park wider there. Always wondered about that wall. A 1937 view of the Rockefeller Institute, above a massive retaining wall. In 1973, a Rockefeller University building sliced into the wall for half a block over the drive at East 64th Street; another expansion over the drive is proposed to the north. 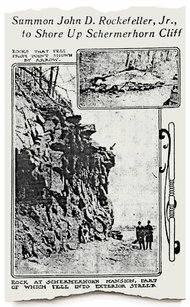 When a 30-foot cliff had collapsed onto Exterior Street in 1911, John D. Rockefeller Jr. agreed to remedy the situation. Rockefeller University, seeking to enlarge its campus, has proposed building a deck over the Franklin D. Roosevelt Drive from East 64th to East 68th Street. The project will darken yet another leg of what was once a sunny waterside stretch of twists and turns. Nor does it bode well for one of the sights of the drive, the great fortresslike retaining wall, a leftover from the days when there really was an East River shore, not just a highway. 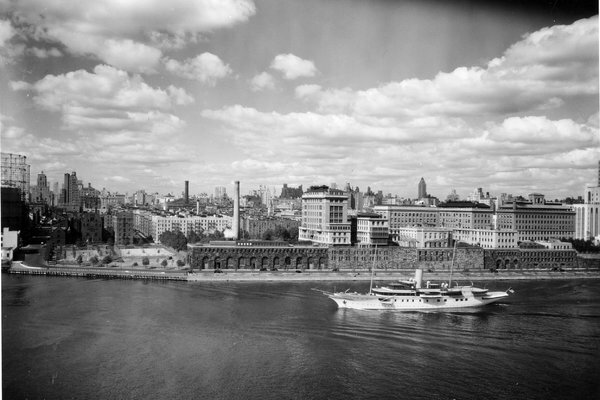 By the beginning of the 20th century, the riverfront along the Upper East Side was still at a remove from the rest of the city, a mix of declining summer houses and gritty industries. In 1901, John D. Rockefeller decided to establish a medical research institute; in 1903 he bought the rustic Schermerhorn estate, from 64th to 67th Street along the East River. The land dropped down to the water’s edge in a rocky scramble. At the same time, the city decided to build a road, called Exterior Street, along the river. Work began in 1904, and the next year The Evening Telegram reported “Thousands of Gold and Silver Coins Dug Up Along East River Exterior Street — One Enriched Workman Off to Italy.” The cache of thousands of English gold and silver coins was unexplained. The first institute building opened in 1906 at the foot of 66th Street, followed in 1910 by other structures. Exact sequencing of the ponderous retaining walls along the drive is difficult to determine, but the one from 64th to 65th Street was not there in 1911, when The New York Times reported that John D. Rockefeller Jr., had been summoned to court because a 30-foot cliff had collapsed onto Exterior Street. Rockefeller agreed to remedy the situation with a wall that remains as the southernmost section, the one with fabulously craggy stonework and giant iron doorways. The stones in the walls are set in a random pattern, and those used for the rocky arches over the windows, called voussoirs, are made up of several skinny sections, which somehow gives them a threatening air, suggesting witch’s fingers. The wall may have been designed by York & Sawyer, known for banks as well as several hospitals, or by Shepley, Rutan & Coolidge; both firms were working for Rockefeller University at that time. York & Sawyer was known for massive stonework, and the Shepley firm was the successor to Henry Hobson Richardson, who made a specialty of craggy rock-faced facades. This may be wishful thinking: perhaps the rocky arches are from the hand of an anonymous engineer. Presumably everyone woke up in 1933 when 25-year-old Elizabeth Baganz, who was learning to drive, also brushed up on her swimming. The Times reported that an unidentified woman who was passing by in her limousine, driven by a chauffeur in livery, jumped into the river to rescue Miss Baganz. Afterward, the heroine refused to give her name and was handed back into her car, which drove away. What is often called the East River Drive was completed along the riverfront in 1942. Far from sleepy, it was a roller coaster of dark and light, ups and downs, twists and turns. In their book “New York 1930,” Robert A. M. Stern, Gregory Gilmartin and Thomas Mellins described it as “One of the world’s most thrilling stretches of multilevel highway.” The moderne styling of the drive collided serendipitously with the hulking retaining walls. In 1973 Gov. Nelson Rockefeller oversaw the transfer of air rights over the drive from 62nd to 71st Street to the institute’s successor, Rockefeller University, and New York Hospital, to the north. The university has already expanded half a block over the drive at 64th Street under the 1973 agreement, and its current proposal for the section immediately north will throw the rest of the drive into shadow. And the wall? The project is still in the planning stages, but Tom O’Connor, a spokesman for the university, says the construction may not affect the retaining walls, although this seems unlikely. To accommodate structural systems and basement mechanical spaces, the University’s first extension neatly decapitates the imposing wall built by John D. Rockefeller in 1911.
part of the FDR Drive. Shown, a view of the proposed platform and new buildings seen from Roosevelt Island. A stretch of the FDR Drive with commanding views of the Queensboro Bridge and the Roosevelt Island Tramway would be dramatically altered under a plan by Rockefeller University to extend its campus over the highway. Pinched for space, the university long ago filled in the nooks and crannies of its campus, perched on a cliff overlooking the FDR and bordered on the west by York Avenue. Despite the institution's storied past as the nation's first biomedical research center, campus officials say that some of their facilities are obsolete, and that without a major investment in its real estate, Rockefeller risks falling behind in the race to recruit the best and brightest young scientists. "New talent is our life's blood," said George Candler, the university's associate vice president for planning and construction. So the university proposed a plan in 2013 to add 160,000 square feet above the highway, including a two-story laboratory, a conference center, an amphitheater and two glass pavilions with offices and a cafeteria. The new buildings would rest on a platform 20 feet above the FDR running roughly between East 64th to East 68th streets, supported by 10 columns along the western edge of the Esplanade, a 3.5-mile pathway between the highway and the East River. The Esplanade along the East River looking north, with the support columns and platform at the left. Plans for the project are still wending their way through the city's approval process. Although the sky would still be clear above the Esplanade, local opponents object to the afternoon shadows that the building will cast on this open space along the river, which is popular with bikers, joggers and dog walkers. "The Upper East Side is completely starved for open space," said Susan Blackwell, a park volunteer who helps with planting and beautification at the southern edge of the Esplanade. Some residents complain that the new structure, slated to rise some 80 feet at its highest points above the highway, would cast deep afternoon shadows, putting that section of the pathway in the shade an hour sooner in the early spring and late fall, and as much as 2 hours and 40 minutes earlier at high summer, according to the city-prepared environmental impact statement. The platform would connect with one of the university's high-rise buildings that already juts out over the FDR Drive at East 64th Street, and with the NewYork-Presbyterian/Weill Cornell Medical Center hospital above the road between East 68th and East 70th streets. It would create a tunnel-like experience for motorists on what was once a scenic portion of the roadway. The university plans to build and maintain lighting for this strip of the drive. Extending the campus over the drive will allow the university to create "a long, linear building, where laboratories can be quickly reconfigured for different types of research," said Jay Bargmann, a vice president at Raphael Viñoly Architects, which designed the project. Some also worry that a potential echo effect created by the deck overhanging the highway could amplify traffic noise on the Esplanade, which is already substantial. The university initially proposed building a 5-foot wall separating the Esplanade from the highway, which it said should keep the noise near current levels. Ultimately, it agreed to raise the wall to 8 feet in response to a request from the local community board, which then granted its approval for the project. The university acquired the air rights to build over the highway from the city in 1973 in exchange for a commitment to make future community improvements. In 1988, it paid $5 million to build a pedestrian bridge to the river at East 63rd Street, which it still maintains today. Rockefeller paid a further $2.2 million in 1993 toward other improvements and maintenance of the Esplanade. Although those two payments satisfied the university's requirements under the air-rights agreement, Rockefeller has decided to spend $8 million on renovations along the Esplanade in response to an environmental impact statement and the community concerns. This money, which is in addition to the $240 million plan to expand the campus, will go toward shoring up the sea wall, installing new benches and water fountains, and planting trees and shrubs that can withstand the frequent inundations of salt water. This portion of the pathway is at best 5 feet above sea level at high tide. The university doesn't plan to add faculty or staff, but expects to move employees from inferior facilities when the new buildings are complete. For example, Rockefeller IT staff members who have worked for years in a temporary tan cloth structure resembling a Quonset hut will eventually move into new permanent offices. Once they do, the hut will be torn down to make way for a new playground at the 115-child day-care center for the faculty and staff. The plan also includes adding a one-story sports center with rooftop tennis courts on a parking lot in the northwest corner of the campus. 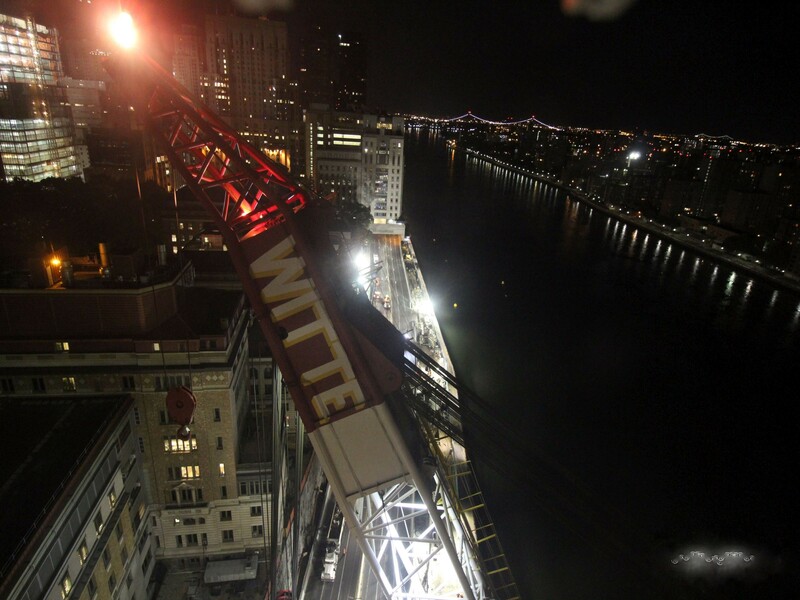 If all goes according to the university's plan, construction will begin next year on the platform, which will be done by lifting the sections over the highway from barges at night. The buildings above the drive would rise by 2017. The improvements to the Esplanade should take shape in 2018, with the other additions to the campus wrapping up by 2019. 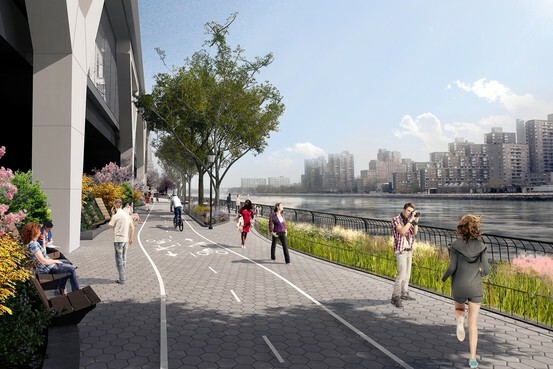 The City Council has approved the esplanade over FDR Drive. Wonder how long it will be before the whole thing is covered. There's a large sections north of the NYH/HSS buildings where any building built would block the view of the existing buildings. So I doubt that will ever be covered over, at least to build up. If the city wanted, and had the vast amount of money necessary, they could deck it over as a park, but I'm not holding my breath for that to happen.